Galloway and I were discussing this the other day. Is Dedric KU's best 3-point shooter? Smart play by Dotson, anticipating the lob for Green after he made the defensive switch. 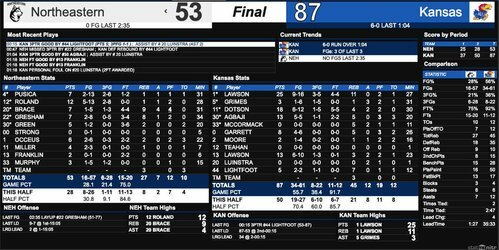 All things considered, a really good half for #KUbball -- Effort was up, execution was strong. But they should be encouraged by the fact that they can play better. KU leads 37-25 at Halftime. Dotson has been stellar on both ends of the floor and unstoppable in transition. He nearly banks in a 3 at the 1st half buzzer. #KUbball up 37-25 at the break. 9 points and 3 boards for the freshman PG. 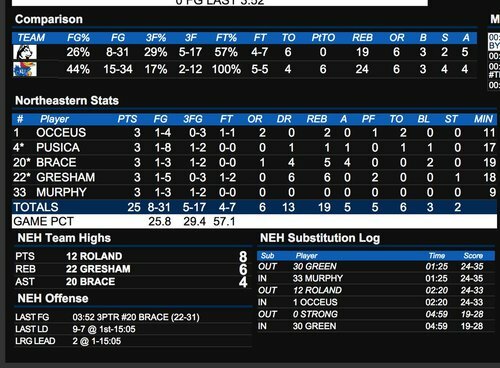 Northeastern did not hit a shot over the final 3:52 of the first half. The Huskies made only 8/31 shots in the first 20 minutes. Marcus Garrett heads to the bench with three fouls. That is less than ideal for Kansas given his importance on the defensive end. 5-0 start to 2nd half for Huskies and Self calls timeout. #KUbball now 4-of-14 from 3-point range. Northeastern is 5-of-19. KU leads 43-30. That was as quick of a move as I've seen from Dedric all year. Left Green — a big, slow Green — standing still. #KUbball up 45-30 with 15:25 to play. The Northeastern assistant is 178 years old. That Northeastern was at the Boston Tea Party. Dedric Lawson has two less 3-pointers (3) than the Huskies (5), who were hyped up to be the Golden State Warriors this week. It seems Bill Self was just sandbagging KJ Lawson for March. Galaxy brain. 14-2 run and #kubball isn't really playing that well. Coaches and players up off the KU bench to applaud Agbaji's offensive rebound and tip-in. Then KJ Lawson scores vs NU's poor transition D and #KUbball leads 53-32. 8 points/3 boards for KJ off the bench. That last play/pass by Moore was so bad and so unnecessary, Self's going to put Dotson back in with #KUbball up 20. If Charlie learned to play within himself and didn't try to do too much, he'd help. For whatever reason, he can't keep it to that, though. Going to the monitor during a 20 point blow out makes perfect sense. A number of almost upsets during the early games. Even with a bad wheel Devon Dotson is faster than Northeastern. Not just the school - the entire region. In the 1st half NU totally ignored KJ in transition for a layup. Those Dotson FTs put #KUbball up 30 — THIRTY! 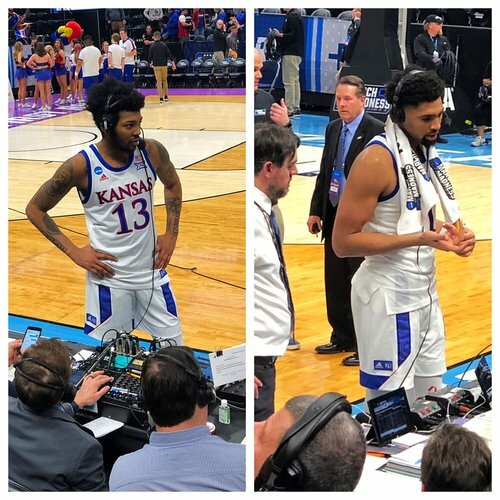 — in a game that Vegas had as a 6-point KU advantage. Unreal. KU's D has been good and Northeastern never got comfortable. It's always great when failed Head Coaches question a Hall of Fame coach that is actually employed. That was me guarding Dedric there. Northeastern just hit a FG for the first time since the Northeastern part of America was just called America - cause no one lived anywhere else. Ochai with a jumper that doesn't matter today but could be important on Saturday... #KUbball leads 79-51, 1:50 to play. Finally Ja Rule is the 2nd most famous Ja.